Have you ever questioned your parenting? Have you ever felt like you are doing a bad job as a mother or that you needed some type of guidance? These are all issues that moms everywhere deal with on a daily basis. We doubt ourselves and sometimes even regret decisions we have made regarding our parenting. This book lays it all out for you in an effort to help change your way of thinking about what it means to be a good mother. 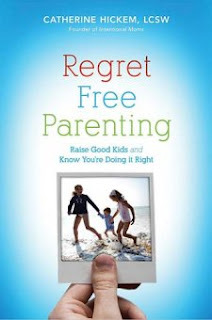 “Regret Free Parenting” helps you see things in a different light. Catherine Hickem did a great job in adding her own personal life stories to help the reader understand the differences in parenting styles. I fully understood why being an intentional parent is so important in our children’s lives. There are also plenty of Biblical quotes to help you think about the importance of having faith in that God is always there. We cannot resolve all of our child’s problems, and we need to trust in God that things will work out. I felt the book was well written and it is an easy read, although you may find yourself rereading some parts, like I did. Her personal stories were great in helping me to see the similarities between her family and my own. There were some sections that pertained to me now and I needed to go over it again and try to use the information I was reading. I would recommend this book to any mother, it can be very helpful in any stage of your child’s life. It is very inspirational!